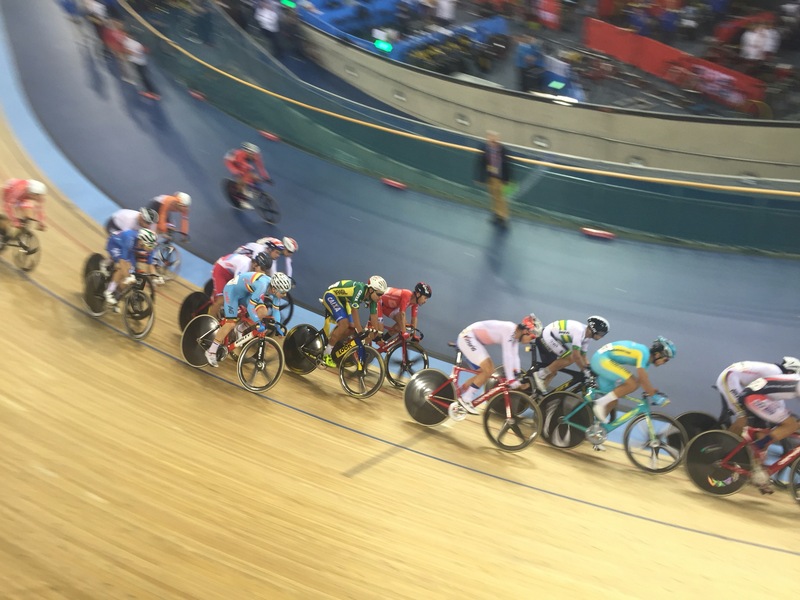 This week I was lucky enough to be working with the UCI at the Track World Championships. Lucky boy, eh? I was there to film all the on track action so that the judges could play back any incident they wanted. No pressure then with Rio, looming a few months away and qualification spots up for grabs! It was great fun and an awesome experience, having an access all areas pass was as good as it sounds and even being in the same computer controlled conditions as the athletes was a privilege. 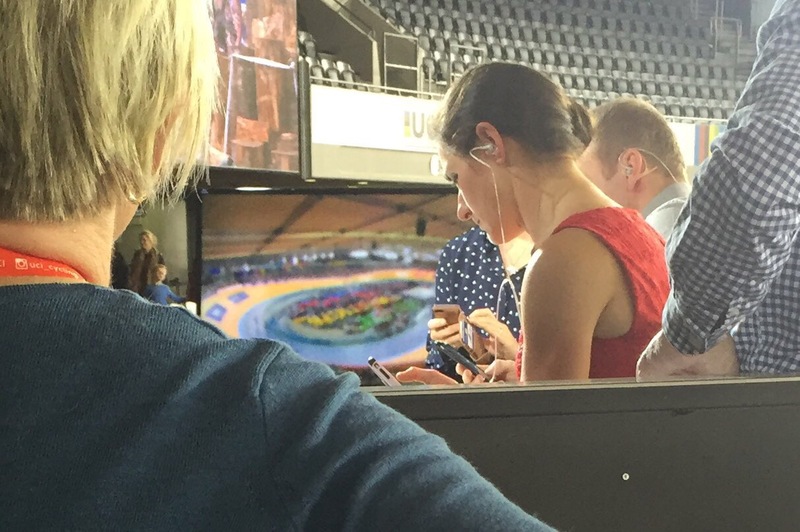 So, what is there to tell you from the track worlds? Well, Team GB don’t warm up the same as anyone else, they have these spaceman type orange trousers too, which look weird. Sir Bradley Wiggins is loved by almost everyone and their dog and the Dutch? Well the Dutch possibly have the coolest bikes. I said coolest, not best looking – I’ll come to that later. Team GB Women on the turbos warming up pre race down under cover away from prying eyes. The British passion for success in the velodrome comes in two forms. 99% of people who go to track events really knows what’s going on and no one really knows the full rules but my god, do they love to see a British athlete going for it and the British fans sure do love a come back. None so much as when Filipino Ganna became the first Italian man to win the individual pursuit at the World Championships since Francesco Moser in 1976. Ganna came from almost half a second down to win by almost a second, the crowd loved it and the noise, well the only time I heard them louder was when Team GB were going against the Aussies for Gold in the Mens Team Pursuit. The crowd was so loud is became a ringing in your ear, I’ve never heard anything like it. Unbelievable. Talking of that pursuit… Well, after Team GB won silver, I saw Sir Bradley Wiggins giving Ed Clancy what seemed to be an awful before the medals, arms were heavily gesticulating and there was a very relaxed looking Ed Clancy sat on the seats, arms and legs spread with an I don’t care air about him. Looking at what’s been said and written I think I may have got it wrong. I think Brad may have been heavily apologising to Ed for peeling off the front and leaving him to bring it home. Ed Clancy hand’t been over 300 Watts until a couple of weeks prior to that race, he’d ben training on a mountain bike and walking up hills to try and gain fitness. It’s remarkable he even made the start of the race, let alone the finish! You can only imagine the more the team train together over the coming months they’ll only get better, I would imagine they’ll have to beat their own world record more than once in Rio to win gold. It was interesting watching the teams go about their warm ups and getting themselves ready for the boards. The most notable thing for me was that Team GB have moved away from the world of rollers, bucking tradition for the much more modern and Team Sky loved turbo trainer. They’ve been on the turbos not in the main central pen but down below the track, away from prying eyes. 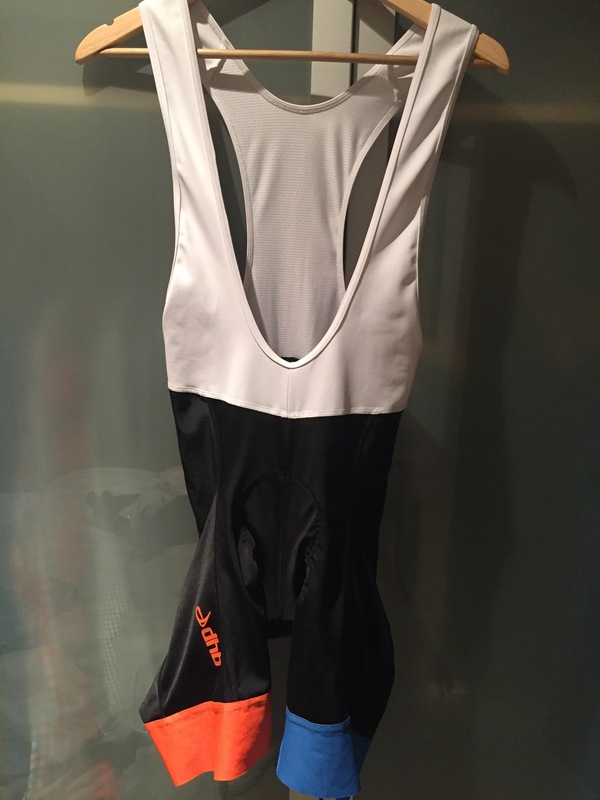 This is reminiscent of when Team Sky first started doing their turbo warm ups in a blackened out tent – there’s nothing wrong with it, I found it added to the tension a bit. See Team GB turn up, start slipping in to their kit and put on their space man orange trousers, take in the atmosphere for a while, before walking down to the turbo. Half an hour of warm up in the bowels of the velodrome on the turbo before putting on the Lazer helmet and rolling on to the track. Oh – those orange spaceman trousers? Hot Pants. 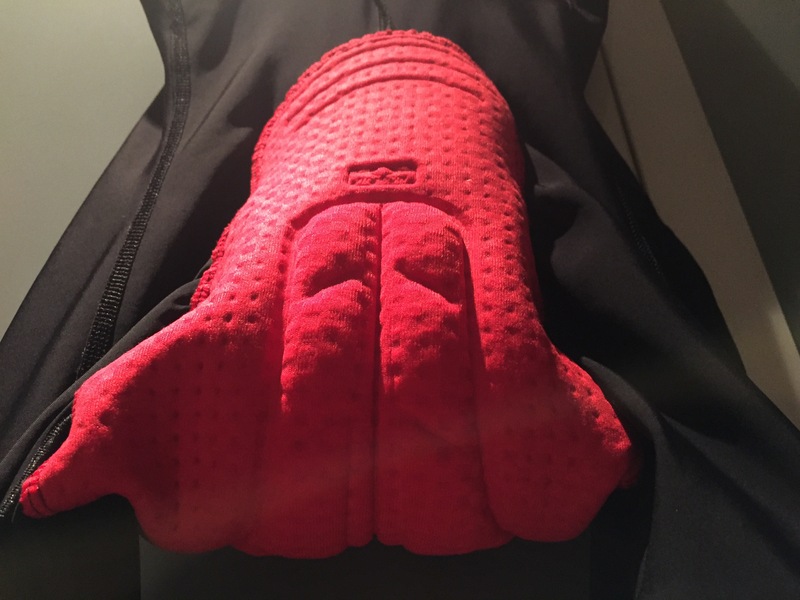 They warm up the riders muscles so that when they start warming up they’re muscles are already close to optimum, enabling a better warm up and a better riding performance. But why so garishly orange? Why can’t they be dark blue like the rest of the kit? Unless it’s some sort of double bluff… ‘Hey everybody! Our secret is these Hot Pants!’ I doubt it, but it would be funny. I stand by what I said earlier, by the way. The Dutch bikes were the coolest, made by Koga jet black with an orange and white wolf/panther beast head just behind the front forks. Even the tyres were orange (slightly red) to match the Dutch team colours. The coolest, yes but the best looking? No. That goes to the Pinarello Bolide of the Italian team. I was having a chat with someone there, we were saying that if you were lucky enough to be a cyclist from any nation, you’d want to be an Italian rider. Pinarello bikes and Castelli kit so stupidly cool and stylish. There was a real buzz around this tournament, not only because Wiggo and Cav were going to be competing together in the Maddison. That feels like nostalgia turned up to 11. But because all of the worlds best were giving others a quick glimpse of their hand before Rio – and Team GB’s don’t look so bad. You don’t want to be winning everything five months before the biggest races in Rio, don’t peak too soon! I was having a chat with one of the other camera guys and he seemed to think the Shane Sutton era was very quickly coming to an end. Personally, I think he’s doing a decent job. Anyone taking over from Sir Dave Brailsford is going to have a lot to live up to, it’s like trying to succeed taking over Manchester United or following Sir Clive Woodwood’s success in 2003. Everyone’s going to jump on you the moment you don’t win every gold. There’s so much more to go on about here though, you could blame Sir Dave for moving cycling on so far that everyone has has been having slightly more marginal gains. Just look at the tumbling times of the team pursuits. Those gains are so fractional now it’s going to take some genius to break the mould again. So – after being there for three days and watching on the telly for two, what was my personal highlight? Meeting Sir Bradley Wiggins, obviously. It was Friday night and he’d just finished doing his bit for Sport Relief. 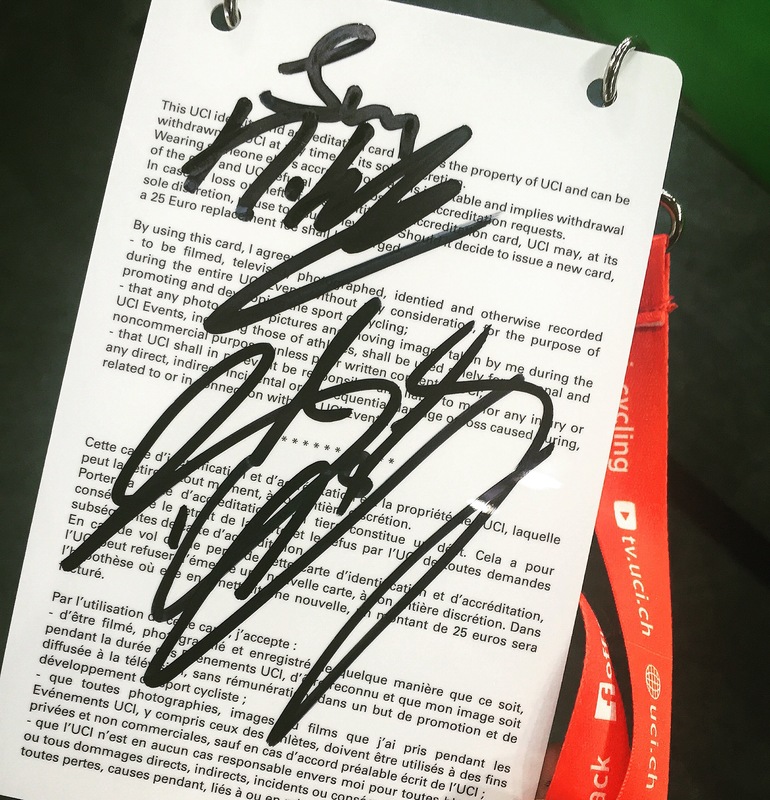 I kept my cool and didn’t just shout “I LOVE YOU!” Well, at least I think I didn’t… We spoke about his hour record briefly and then I sheepishly asked if he’d sign my pass. Then new world champion Jon Dibben signed it too. Again, I kept my cool… Surprisingly, Dibben said he didn’t think he had it in him with 100 laps to go, looking at him sprint at the end, you’d think the other guys had lost it from 160 laps left. What a ride. It comes a close second to Brad and Cav winning Madison gold though, when those boys set their minds to something, they more often than not come out on top. To change disciplines from road to track like that and do what they’ve done, someone give me another superlative other than, unbelievable. 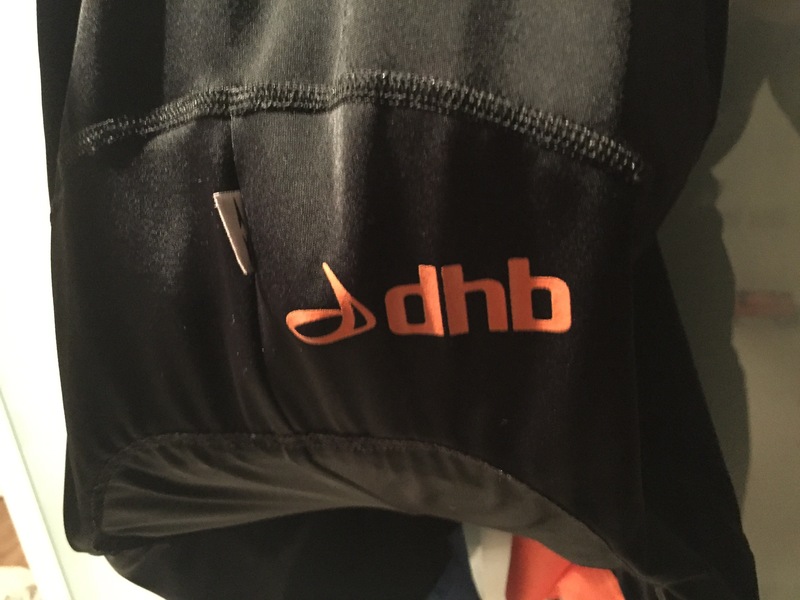 Jon Dibben’s signature at the top with Sir Bradley Wiggins’ beneath it. All in all, what a world championships, everyone is always so complimentary of the Lee Valley Velodrome and it is a fantastic place, if you get the chance to roll on the boards, you definitely should. Who wouldn’t want to in the same place which Team GB was so prolific at London 2012, Wiggo smashed the hour record and Jason Kenny emptied the tank, completely, to take World Champion sprinting gold. I’ll leave you with one of my favourite photos I took there, the BBC presenters ‘working’ during and interview being aired on television. What could be so interesting on their phones?